Selecting the right propeller for your boat and engine combination: The proper propeller size for your boat and engine combination is based on the wide open throttle operating range for your particular engine. This can be located in your operator's manual. This will be expressed in terms of a certain horsepower at a certain RPM. The goal in propeller selection is to determine what propeller style and size will maximize performance for your boat, while allowing your engine to operate in the recommended RPM range. The correct propeller will prevent the engine from over-revving, yet allow it reach the minimum RPM where maximum horsepower is produced. Using your existing propeller, determine what is the maximum RPM you are able to obtain. If during this test, you begin to exceed the maximum rated RPM of the engine, reduce throttle setting to a position where maximum RPM is not exceeded. If your test results in your being able to over-rev the engine, you need to increase the pitch of the propeller. Increasing the pitch increment by 2" will result in approximately a 300-400 RPM drop. If your testing shows, however, that you are only able to obtain an RPM somewhat lower than the maximum rating given by your engine manufacturer, you would need to decrease pitch. Decreasing pitch would increase your RPM. Switching form an uncupped to a cupped propeller will also reduce your RPM. The cupped propeller of the same pitch and diameter will typically reduce your RPM by approximately 200. 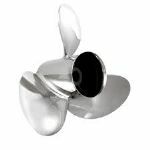 Once your wide open throttle RPM falls within the recommended range of the engine manufacturer, you have a propeller that is suited correctly for your boat with respect to RPM. You may, however, not be satisfied with respect to skiing performance or trolling speed. It is best in circumstances like this to have two propellers. One to accommodate on set of circumstances and the other to perform best under the different load. It could, in fact, be that more that one propeller will be suitable for your boat and motor combination depending on your usage. It is imperative, however, that the wide open throttle RPM fall within the range specified by your engine manufacturer.